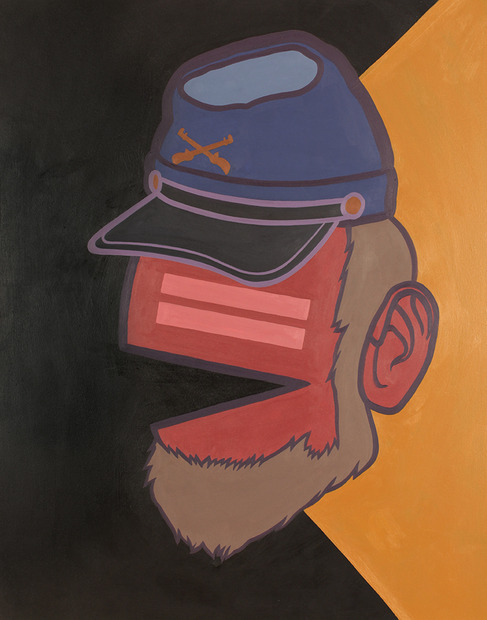 Young Min Choi, Bearded Equalizer, acrylic on wooden panel, 20" x 16"
I am a Korean artist who lives and works in Brooklyn, New York, USA. I have been practicing my art world since I was seventeen, and now I am attempting to make the world understand my art through incorporating my perspective and translation towards the world. I love the concept of the whole project that reflects the way we have conversations with each other. As the words get passed on, certain contents in the original context will be distorted based on each individual’s subjectivity, and I am really curious about how other people perceived my translation. Since Satellite Collective worked hard on managing the project, I really had no difficulties. Everything was enjoyable including the effort to translate the poem from the previous person. My question is, since so many different people will be participating in this project, there might be the ones who may create works that are totally opposite to your thoughts or purpose. Would you embrace them or secretly dislike them? Just being curious. The insight that I have gained was that every genre of art could affect each other. We are all eager to express what’s in our mind and we are only using different methods to do so. Some do it with text, some would use their bodies (performance art), some would use sound or some would use visual images. All are enjoyable and somehow influence each other. I think this project will show that conversations can also be conducted using these methods. Thank you Nathan and Satellite Collective. I love this project so much.